If you’re looking for the top rated ceremony locations San Diego has to offer, look no further. 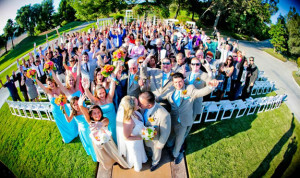 Steele Canyon Golf Club is the perfect setting for your wedding ceremony and reception. Having some of the nicest wedding ceremonies San Diego, our ceremony arbor features sweeping views of our manicured golf course, water features and the beauty of the surrounding beauty, convenience and simplicity are all words that our brides use to describe our ceremony arbor when they first see it and after they have taken their official “walk down the aisle” at Steele Canyon. Beautiful because the views encompass lush fairways, rolling hills and majestic natural surrounding that are second to none. If you think it is beautiful now, just wait until sunset! Convenience is defined by the few short steps you and your guests will take to begin the festivities in our pavilion or on the sunset deck. This makes the coordinating of all aspects of your ceremony and the transitions flow with ease. Simplicity is by design as it allows for many options of décor and theme. The slightly raised staging of the arbor offers an intimacy where all of your guests can see and share every expression and moment of your exchange of vows, from the front row to the last. 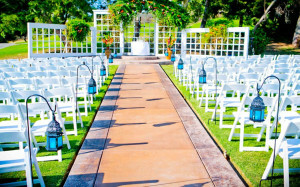 We are one of the premier wedding ceremony locations San Diego has to offer. From the moment you realize that Steele Canyon offers all of the amenities and options you desire for your wedding, we offer guidance and aids to walk you through designing the perfect ceremony that reflects the love and personality of you, the bride and groom. We have extensive photo albums from San Diego’s top photographers to help you make those important decorating decisions. We provide complimentary services in conducting your rehearsal through being on hand to see that your ceremony goes just the way it was rehearsed. We will work side by side with your vendors to make sure that setup is complete and the sequence of events will flow seamlessly from the moment your first guest arrives through your departure at the conclusion of the reception. We believe the complete spectrum of assistance that is included with every wedding at Steele Canyon sets us apart and makes us the leader in San Diego by which we are proud to be compared. Steele Canyon had everything we wanted for our wedding venue. It was the first venue we looked at when we began our search, looked at many but kept coming back to Steele Canyon. The picturesque photo opportunities are abundant! Barry Rice was amazing! He not only served as our day of coordinator but was there for the entire process. He always got back to me with any questions I had but most of all was supportive and kept me under control on my wedding day. Our wedding was beautiful. The guests had a great time and we had so many complements on the venue, staff and the delicious food. I highly recommend Steele Canyon for anyone looking for a wedding venue.